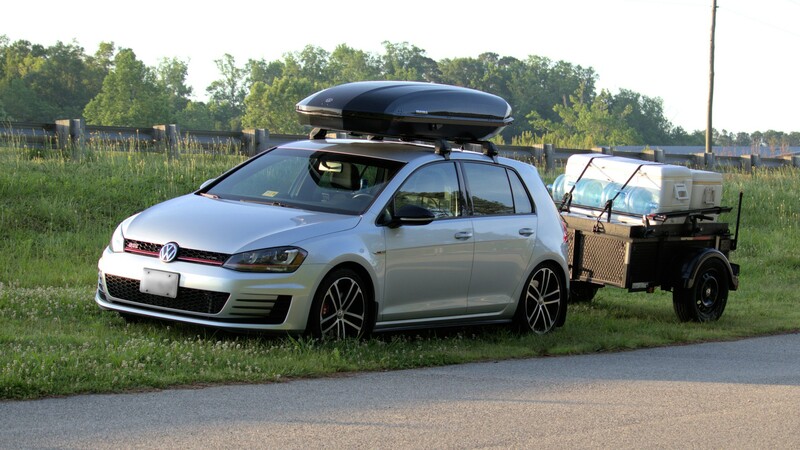 I had planned to enter my car in Sunday’s BugOut 81 show in Dinwiddie, VA. However, ongoing home projects and a long day on the road Saturday precluded me from making it a priority. What was I doing on the road Saturday? 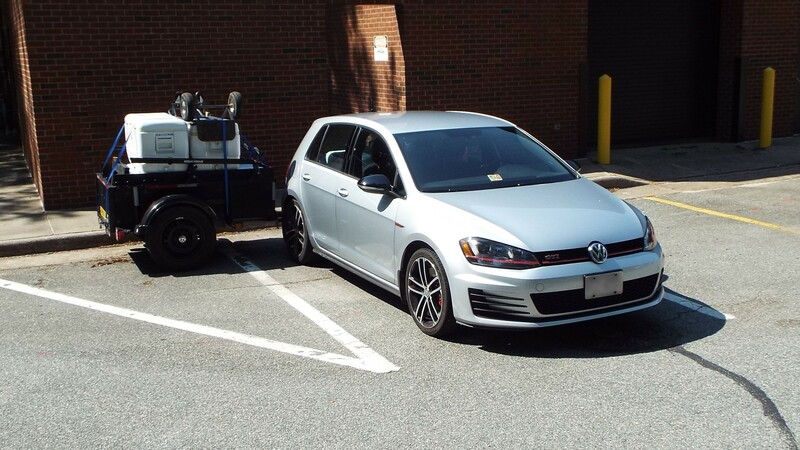 With no VW show to blog, here’s a story about driving behind the scenes in support of a growing bicycling event. 🙂 My local bicycling club, the Peninsula Bicycling Association (PBA), hosts two major events each year, one in May and one in September. I started driving a support vehicle (aka “SAG” vehicle) instead of cycling these events in 2012 as a way to serve the club. It became a tradition for me; I even served as SAG coordinator from 2013 to 2016. . SAG vehicles patrol the roads to retrieve riders with mechanical failures or those whose day just isn’t going as well as they had hoped. Our volunteer workforce is too small to assure immediate recovery, but I can confidently state that NO ONE is left on the road for long. SAG drivers used to shuttle water as needed as a secondary duty, which became more of a challenge over time as our events grew. 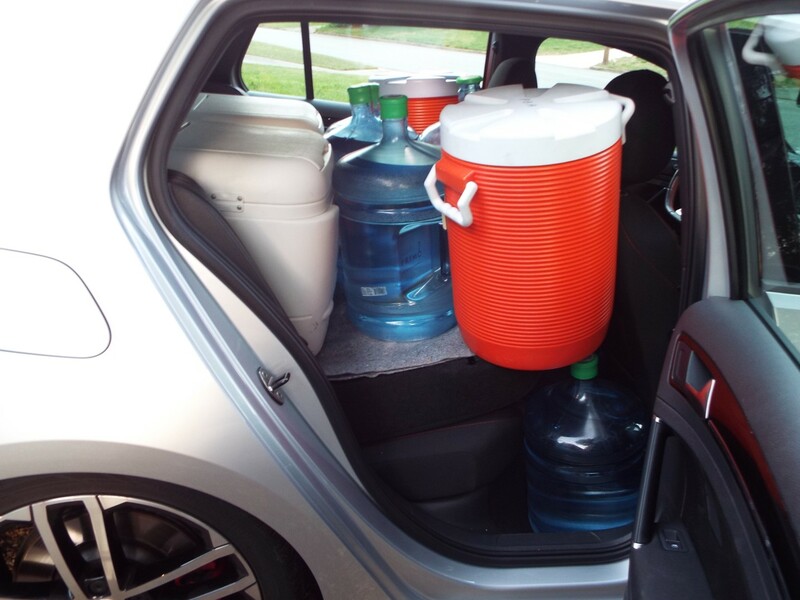 Before 2014, the club’s five-gallon water coolers were passed from volunteer to volunteer. The management was pretty loose and it was time for a change. I volunteered to take possession of the water coolers and continued as the SAG coordinator. The water/SAG dual-duty made for some long event days! 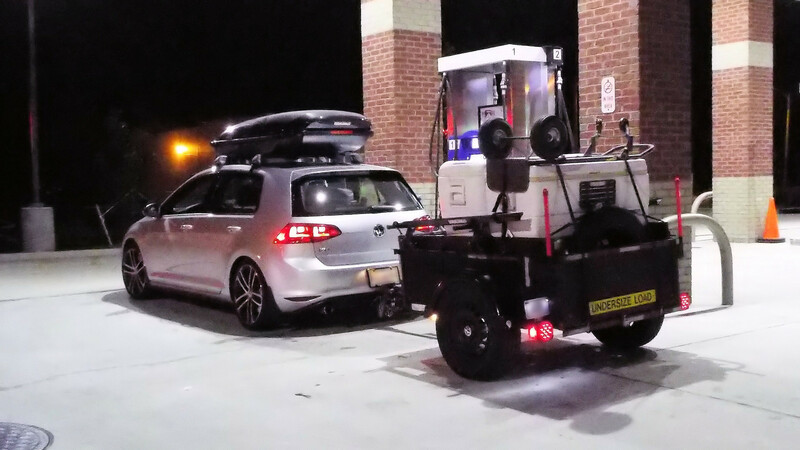 Delivering water AND acting as SAG driver created a problem: Imagine needing to drive 10 miles in one direction to retrieve a stranded cyclist and then getting a call to learn that a rest stop 15 miles in another direction is about to run out of water. Waiting with a broken bike for a ride back to the park is a drag. But having hundreds of riders stuck in the boonies without water is far worse, depending on one’s perspective. With a separate SAG coordinator, I’m able to focus only on the water. Better yet, I am free to transport the water along the roads not traveled by cyclists, which means I can get between the rest stops a little faster by taking direct routes. What is my process for making this work, especially with a compact car? PBA has 16 water coolers. I clean, bleach, rinse, and dry the coolers before and after each event. I load my “baby trailer” with 12 water coolers the evening before the event. Contrary to popular belief, these coolers are NOT watertight and will leak as water sloshes during transport. Therefore, the four remaining coolers ride empty inside the car and get filled on site with a dedicated hose and inline filter. I augment the coolers with eight 5-gallon bottles that I use as transport containers during the day, which allows me to leave the coolers at their rest stops. They all fit inside the rooftop cargo box. I also added ice to my load since I have a couple of extra-large ice chests. Large amounts of ice have proven very popular on hot days. I use an “ice house” that dispenses freshly bagged ice near my home. Their ice is less expensive than convenience store ice and the cubes are loose and easily packed without leaving the bag. My chests carry ~200 lbs of bagged ice on top of the water coolers in the trailer. Starting in 2017, I added a pair of large (albeit it slightly smaller than my own) rental ice chests so that I could take even more ice to all the rest stops. I can fit the rental coolers in the hatchback with the rear seats folded flat (see the photo below). I brought ~350 lbs of ice to last weekend’s event. I may bring 450 lbs next time. I usually leave my house at 5:30am, drop off coolers and ice at the first rest stop, then go to the venue to drop-off more ice and coolers before filling the empty coolers. I fill the transport bottles after I drop off the remaining water coolers and have room for them in the trailer. As rest stops close for the day, I move the leftover coolers to other locations to avoid shortages. Some events run more smoothly than others, but I haven’t run out of water in several years. I missed miscalculated one stop my first year (before the transport bottles), but I managed to catch each rider along the route and fill their bottles on the road. The rest stops are usually over-watered these days, so I don’t expect anyone to run dry on my watch. What’s the total strain on my little car? The load on the roof is less than 100 lbs since I transport only empty bottles in the cargo box. The interior ice chests weigh ~150 lbs and the trailer’s tongue is ~125 lbs. That’s well under the car’s GVWR. The 12 filled water coolers on the trailer total ~480 lbs. Adding that and ~200 lbs of ice to the weight of the trailer results in a total load of ~1030 lbs. 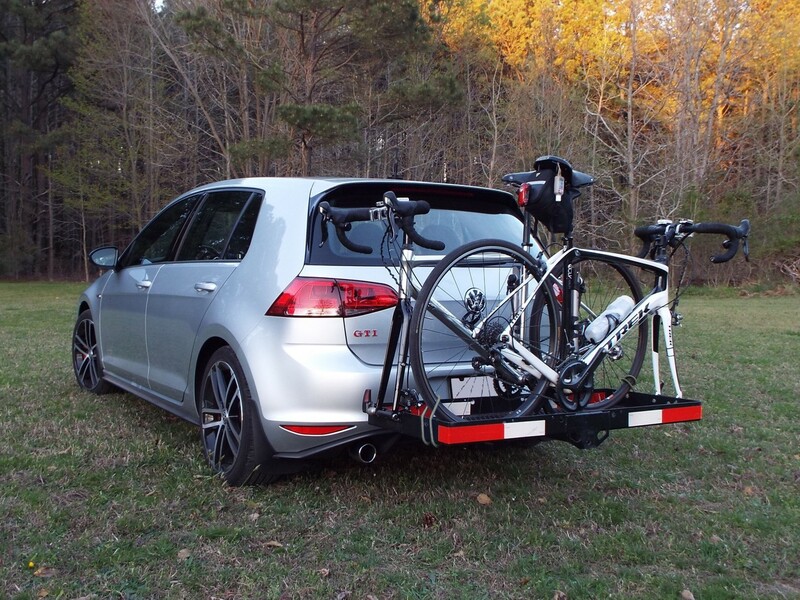 The trailer’s ultra-low deck makes loading and unloading a cinch. My car has plenty of power and torque, an upgraded clutch, and powerful brakes. Therefore, this relatively light load is not over-stressing anything. A truck may have greater capacity, but I don’t need the full-time penalty of owning a truck for the part-time benefit of having one available. 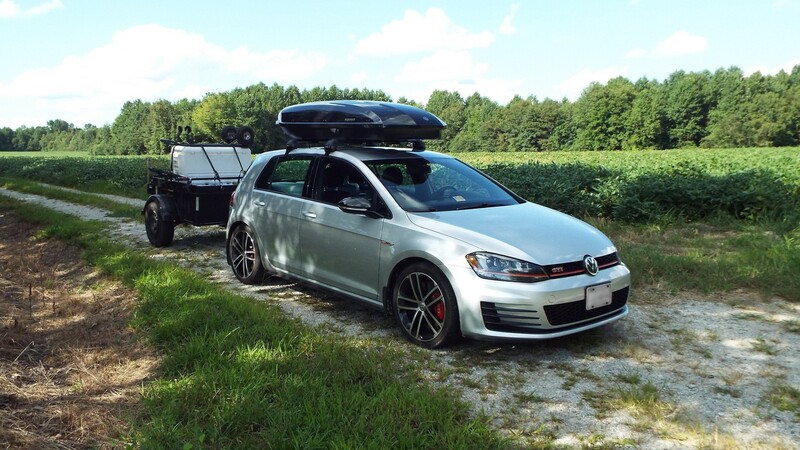 The car and trailer do a great job! 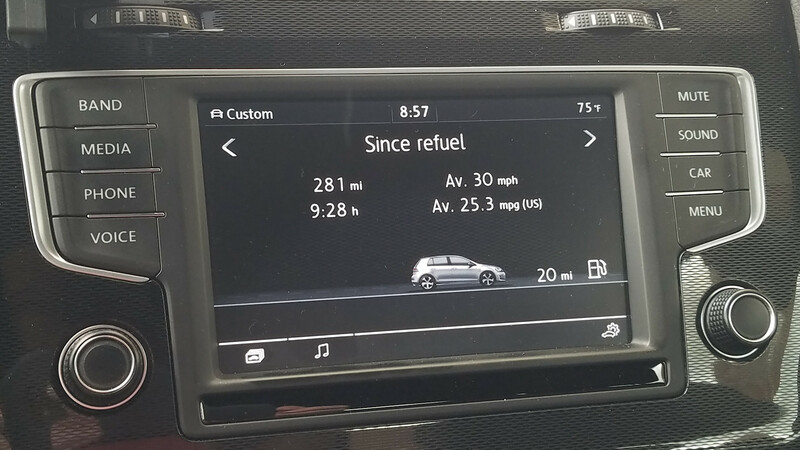 The combination is also more maneuverable than a truck and still averaged 25 mpg throughout its 323 miles of support driving during the event. It’s probably the coolest water trolley I’ve ever used! Oh, I can still transfer two bicycles, if needed, too.